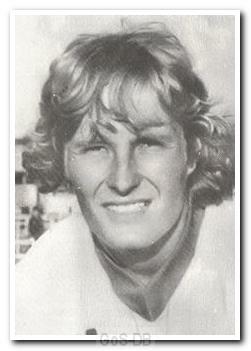 Hartlepool-born Gooding started his career with Coventry City after he was signed by Gordon Milne in 1976. With a midfield that included Tommy Hutchinson, Terry Yorath and a young Gary Gilllespie, it was always going to be a difficult to establish himself, but he still managed 49 appearances in his time at Coventry, which included a month's loan to Bristol City in 1981-82. Joining Argyle for the 82-83 season, he made seven straight starts and scored in the home win against Wrexham in September 1982. However, his stay with Argyle and indeed his entire career was curtailed by a cruciate ligament injury, which forced his retirement from the professional game. He then played briefly for Bedworth United before giving up the game. Gooding returned to John Sillett's Coventry in 1988, playing a key role in coaching two sides to the FA Youth Cup Final before returning to his native North-east to work as an Academy Scout with Newcastle United.